On Saturday Week 2, peaceful protests swept the globe to take a stand against the hateful politics of the Trump administration. The worldwide movement grew out of the collaborative Women’s March on Washington, with more than 200 marches against misogyny and intersectional issues of race, religion, and LGBTQ+, amongst other things, taking place in the United States alone. To show solidarity with the larger number of Americans who voted against Trump and those unable to vote, and to make a clear statement to the world that women’s rights are indeed human rights, similar marches were held on all seven continents, including Lancaster. 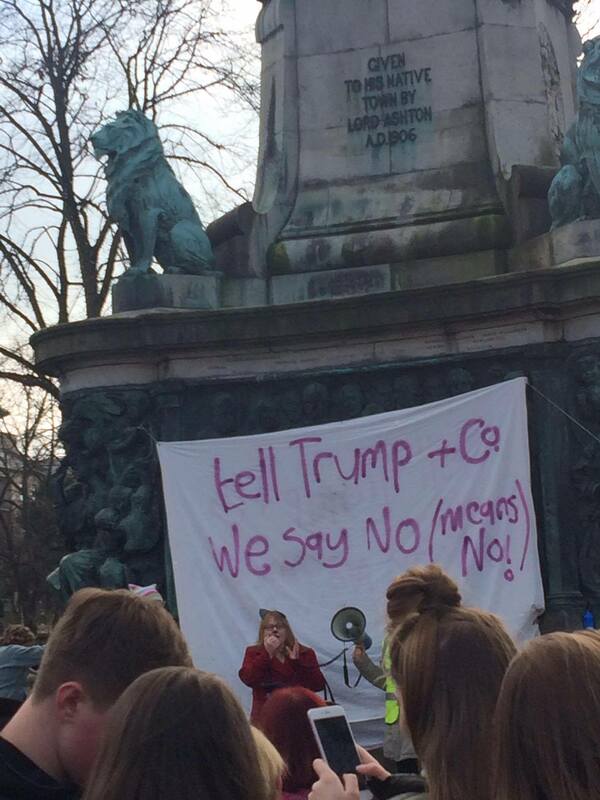 At least five hundred people congregated on Dalton Square with banners such as “tell Trump and co we say no (means no)” for a peaceful yet determined celebration of diversity. From young teenage girls to elderly women, all from a range of ethnic and religious backgrounds, and various sexualities and gender identities, made strong feminist statements through impassioned speeches, poetry, songs, and most importantly, complete acceptance.